Whenever confronted by increasing intolerance and increase in incidences of communal violence in the country, the standard response of the BJP leaders and spokespersons is that incidences of communal violence took place even during UPA regime in particular and Congress regimes in general. They point out the anti-Sikh riots in 1984 in Delhi and other states; and various communal incidences that took place when Congress Party was in power. Besides the fact that incidences of communal violence have actually increased in the year 2015 to 650 from 644 in 2014, it would be simplistic equate the incidences of violence merely on the basis of statistics. Incidences of communal violence cannot be a stand alone indicator of culpability of various political parties as their roles and relations to communal violence are different. Communal violence is not a spontaneous incident. Paul Brass dismisses the prevailing notion that riots are simply spontaneous “eruption of angry” of one community against over some differences. But on the contrary riots are planned and brought about deliberately by “specialists”. Brass concluded from his study of various incidences of communal violence that a communal riot is planned and executed by “experts” and organized body which he calls Institutionalized Riot System (IRS). There are important characteristic of institutionalized riot system. To engineer riots there is recruitment of personnel under the leadership of a prominent political leader. Riots are brought about when ordinary people are mobilized into a mob with provocative exhortations and speeches that heighten anxieties and instill fear of the “other” community. The heightened anxieties and fear of the other community result in keeping away from the targeted “other”, condone violence against the targeted and even participate in the violence against them. The outcome of heightened anxiety and fear of the targeted “other” is – overlooking diversities in beliefs and cultural practices within; overlooking oppressive and exploitative structures within and rallying behind those who are responsible for their exploitation, oppression and marginalization rather than joining ranks with similarly exploited, oppressed and marginalized of the targeted “other”. The provocative speeches and exhortations obliterate the shared values, culture and everything that is common with the targeted community. It results in political consciousness based on “us” and “them” – them being the targeted community. Once the political consciousness is so polarized, the dominant communal elite are secure in their position despite oppressive, exploitative and marginalization structures within that ensure hegemony of the elite. Electoral benefits are immediate benefits and ‘us’ ‘them polarization the long term benefit. This machinery of IRS is built overtime and kept dormant and activated at times when it is convenient to the vested interests. The system is activated when the intentions are to polarize communities in order to reap rich electoral dividends. Thus riots occur “near elections to bring about a change in the political balance” as explained by Paul Brass. So strong is the IRS that it can withstand the good relations built between communities and prevail over saner voices of both the communities. When not occurring before elections, riots can occur as a rehearsal for future violence. The Hindu nationalists have been systematically engineering communal riots in India and have benefited electorally from them. The Bharatiya Jan Sangh till 1970s and the BJP after 1980s have singularly benefited electorally in the aftermath of the communal violence, with the exception of anti-Sikh riots in 1984 and anti-Christian violence in Kandhamal in 2008. In the former case, Congress leaders led the anti-Sikh violence (PUCL-PU DR, 2003) and benefited electorally therefore, and in the latter case, the snapping of alliance by the Biju Janata Dal, dominant political force in Orissa, with the BJP prevented the BJP from reaping electoral benefits of the Kandhamal riots. The Hindu nationalists have used communal violence for expanding its base geographically as well as socially. What else explains sections of dalits identifying with the Hindu nationalists who never were enthusiastic supporters of affirmative action for social justice in the form of reservations and even offer apologetic explanations for the caste system? Outbreak of communal violence during the Congress regime benefitted the Hindu nationalists, resulting into communal polarization and electoral benefits. The culpability of the Congress regime was that of failure to prevent and later control the riots effectively even when the administrative machinery was sufficiently capable of doing so. Post riots, the Congress regimes allowed those culpable in planning, engineering and taking part in the riots to slip through the criminal justice system unscathed, and even untroubled. This emboldened the Hindu nationalists to orchestrate to escalate the scale of riots. If the Hindu nationalists were guilty of commission, the Congress regimes were guilty of omission. 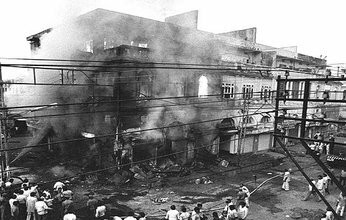 On two occasions major pogroms were organized with virtual impunity (even though just a few foot soldiers being held guilty), – anti-Sikh riots in 1984 and Gujarat in 2002, when the rioters on the streets and the regime in power belonged to the same political party. Therefore, it would be a fallacy to compare the degree of culpability of BJP and the Congress merely on the basis of number of communal incidences under their respective regimes or number of deaths during respective regimes. The Hindu nationalists were culpable even during the Congress regime as they managed and developed the IRS then. Various Commissions of Inquiry, appointed to find the causes of riots, have brought out the role of Hindu nationalists in the riots. The role of IRS of the Hindu nationalists can be discerned from the findings of the Inquiry Commissions. The IRS of Hindu nationalists in various places, recruit personnel indoctrinate them ideologically and mobilize mobs through provocative exhortations and speeches against the targeted other. 31 inquiry commissions were constituted till date to inquire into 31 communal incidences. The reports of these commissions brought forth some insightful findings in terms of the role of politicians, ideologies and police. Some commissions were unequivocal in fixing responsibilities and spelling out the actors involved in planning and carrying out the communal violence. Justice Srikrishna Commission which inquired in the Bombay riots of 1992- 93, stated that the riots were fallout of the demolition of Babri Masjid, and provocation of Muslims by blatant celebrations of the demolition through rallies. The Commission observed that there was no doubt that from 8th January 1993 at least, the Shiv Sena and Shiv Sainiks took the lead in organizing attacks on Muslims and their properties under the guidance of several leaders of the Shiv Sena from the level of Shakha Pramukh to the Shiv Sena Pramukh Bal Thackeray who, like a veteran General, commanded his loyal Shiv Sainiks to retaliate by organized attacks against Muslims. The Bombay riots claimed over 2000 lives according to unofficial estimates. 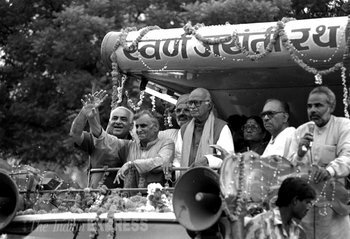 Justice P. J Reddy Commission which looked into the Ahmadabad riots, 1969 stated that the Jan Sangh, the Hindu Mahasabha and other communal minded Hindus were involved in the agitation and had contributed to communal tensions just before the Jagannath temple incident. 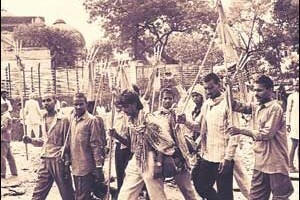 Jana Sangh workers were found participating in the communal riots in Ahmadabad. Similarly, the Jan Sangh workers and communal minded persons created trouble and spread rumors, and ineffectiveness was witnessed in the manner of counter acting rumors. Substantiating this narrative, the police commissioner of Ahmadabad deposed before the Commission that the Bharatiya Jan Sangh and other communal minded persons created communal trouble in the city. 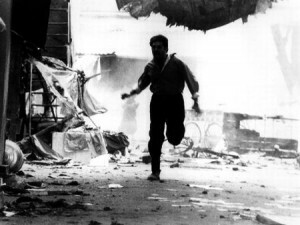 Over 500 lives were lost in the riots. Similarly, the Raghubar Dayal Commission inquiring into the communal incidences of Sholapur on 17th September, 1967 and 18th September, 1967 in Ahmednagar found that the Rashtriya Swayam Sewak Sangh, Jan Sangh, Hindu Maha Sabha Majlis –e – Mushawarat, Jamait- e- Islami and Muslim league were active in the incident, as they wanted to use the incident for their political objectives. The Jitendra Narayan Commission appointed to Inquire into the communal riots in Jamshedpur in 1979 found that the R.S.S had raised evocative religious issues and roused communal passion. The Commission further found that the RSS played their role in the matter motivated by the long term political objective of gaining strength for their political wing. The Commissions of Inquiry also blame the police and the administration for the ineffective measures in controlling the riots. None of the Inquiry Commissions blame Congress for spreading hatred or rousing communal passions to engineer a communal riot. Ineffective measures in controlling riots enabled the Hindu nationalists to engineer even more riots and on larger scale. Their IRS strengthened and became more and more fatal. The Congress regimes must however never be forgiven for non-prosecution of those responsible for planning and organizing riots. Had effective prosecutions been launched after a riot, the IRS would have been dismantled. With the help of the IRS, the Hindu nationalists expanded geographically to the South and socially bringing in a section of adivasis and dalits within its fold. The 2002 communal riots in Gujarat not only effectively liquidated the Congress in Gujarat it also eventually brought the BJP to power in the year 2014 with majority on its own. The IRS is still kicking and operating spreading intolerance. However, the civil society has taken on the monster this time.